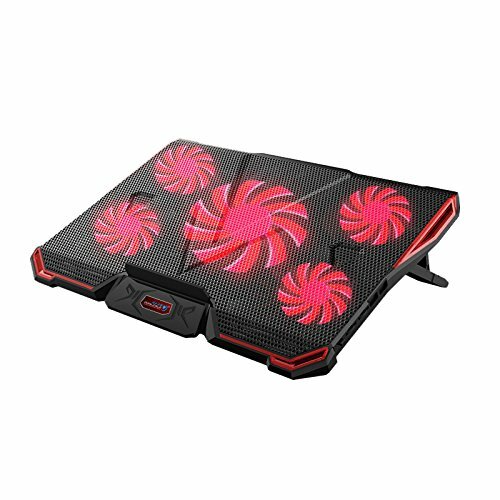 Futura Portable Laptop Cooling Pad creates a continuous and evenly dispersed air flow beneath your laptop to dissipate the heat generated by the CPU and GPU trapped in the laptop housing. It has great cooling power and all features you need while remaining slim, light weight, and quiet. Application:10"-16" laptop, such as Apple Macbook Pro Air, Hp, Alienware, Dell, Lenovo, ASUS, etc laptop computer. Adjustable Height Settings: 7 height settings for your choosing to position your laptop at ideal viewing and provides you with the most relaxing incline angle for all-day viewing. Adjustable fans speed gives you the best balance between silence and performance. 5 Fans provides maximum cooling, reduces heat and enhances cooling performance by up to 20% when compared to no cooling pad. Built-in 2 USB hub. This laptop cooling pad is conveniently powered by the USB port on your computer, with no power adapter needed. Quality Assurance: 12-month hassle-free warranty and friendly customer service. If you have any questions about this product by Futura, contact us by completing and submitting the form below. If you are looking for a specif part number, please include it with your message.